A good covering product that goes further than expected. However the smooth sponge roller does not allow the 'dimples' to be covered without a lot of ' squeezy' pressure. Pnly time will tell how long it stays dark in the sun UV, but first impressions very favourable. Great product which completely transformed my driveway into looking like new.Several compliments from neighbours. Just finished applying to my 18 year old tarmac drive and it looks like new. It was easy to apply and covered very well. My drive was ~ 40 m3 and the 20 litre container was more than enough for 2 coats. Not had any traffic on it yet to test for durability. It went on very easily and looks great. It has completely transformed the appearance of the drive. I was advised that I would need 2x 20 litre tubs but I managed to apply 2 coats fairly liberally and still had some left in the first tub. The cost of postage to return a tub does not make it a viable option, so I am hoping that a neighbour offers to buy it! Great product which has transformed my driveway to look as if it is a new drive for a low cost. Highly recommended. Looks really good for a fraction of the price of new tarmac. The second coat went on very easily so it took less than a day to complete the job. Great product my drive looks like new ! Brilliant. Fast delivery. Easy to use and old tarmac looks like new! Coverage is fantastic and goes on easily. One small snag - handle of roller snapped on very first roll.! Other then that a great product - time will tell how effective it will be. Looked good after one application with a brush and easy to apply to tarmac that is past it's best. Left the review for several weeks as I expected it to flake but it is still sound so far so good. Really happy with the products it was a pleasure to undertake resurfacing the drive. Two coats and minor repairs and I have a drive that looks like it cost thousands. Well done SmartSeal excellent products would definitely come back and recommend to friends and neighbours. This product is fantastic. I ordered the sample and painted on a part of the tarmac which was particularly shabby. It went on like a dream and covered very well. I have wet it, walked on it and am now leaving it for a while to see how it weathers. I suspect that I will be so pleased that I will order a 20 litre tin to cover the area I need done. Used this product before, recommended and ordered for neighbour who also thought it was first class. By Keith Beaumont From Thornton-Cleveleys. Recently bought 20lts of black tarmac restorer the service was excellent delivery prompt.I applied two coats to my drive the 2nd coat I added a fine grit to the mix as before the drive was slippery when wet or icy the result is excellent not the cheapest but one of the best. Another area of tarmac brought back to life. Excellent product and service. Thank you. Delivery was quick and the product does exactly what it says. 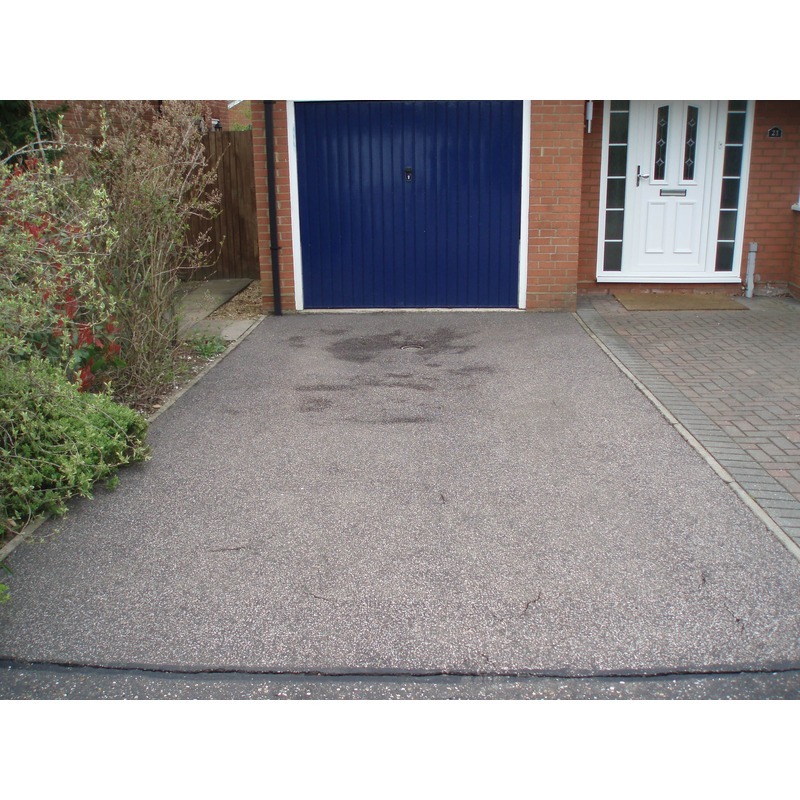 Good thick black coverage and has restored a tired driveway , which now looks like a newly laid surface. Tarmac restorer does exactly what it says ,you can buy cheaper options but this is quality item. Excellent results for regenerating my old driveway. Even used it on my existing concrete paths. Easy to apply and foot traffic within a couple of hours. Delivery within 24hrs of order definitely recommend this product. Top product, has brought a drive of age approx 15 years back to looking new. Bought four 20 litre drums and used three and a bit on a 130m2 drive. First coat hard work, took about six hours for one person, but second coat much easier. Touch dry period between coats was less than two hours at a temperature of 18 c during application. Left for 24 hours before using it for cars. No adverse effects. The 20 litre cans are obviously going to be heavy but are easy to empty into the roller tray. But the HSE would probably like a take care lifting warning on the side of the can. First class product. Used with crack repair compound. An unmaintained 20 year driveway now looks fantastic. Loads of favourable comments from neighbours. Prepared well and covered 140m square metres with two 20L tubs. Good video helps easy application. Spare tub means doing my parent's driveway now! Recommend changing roller every 30-40 metres to ease coverage. This tarmac restorer does excactly what it says on the can, good stuff! excellent product, I applied the tarmac paint using a masonry brush on a pole so that I can work it into the surface. It dries very quickly and seals small cracks and fills in those small indents where moss can start. The end result had people asking me if I had new tarmac put down so very pleased with result. Drive used to be green .Gave it a good power wash. Two coats of tarmaseal. Its keeping like new. Money well spent. Used to re-seal a rough , mixed aggregate driveway - Tarma seal works very well and feels like a premium coating product. Finish is looking very good indeed. Broom handle on roller kit broke in 15 minutes , as per other comments, a stronger one would be good. Real test of an Aberdeenshire winter coming up for the new driveay. My drive wasn't great before the builders came to add an extension, with all the resulting concrete staining it looked terrible. With two coats it really does look like new, better than it has ever looked, everyone thinks on first glance I have had the tarmac re-laid. An excellent product,used it on concrete and it gave a really good finish. The service was great too, received the product the day after ordering! Tarmaseal first time I have used this, I found this product brilliant it covers well and with a second coat the drive looks like new, would recommend it to anyone that is thinking of refreshing there tarmac. Tarmaseal is an excellent product that is so easy to use. It has excellent coverage and the 20 container covered 60m2 twice. My drive now looks as though it is brand new. Ordered this last year, only just got to put it on. Excellent product and service, also super fast delivery. How to videos were great help. Very HAPPY with finished look. Would absolutely recommend both product and company. I applied two coats of the Tarmac restorer last year and then again this year. Last year I applied two coats in ideal weather conditions and the results when finished were outstanding. The finish however appeared to start to deteriorate quickly once rain had occurred in areas where either a car was parked overnight or driven. The weight of a car on the drive and driving the car along the drive to the garage was slightly lifting the coating. I finally gave up touching up the worn areas and a year on as the drive colour had faded and the worn areas in real need of attention I decided to try again in order to give the drive a facelift. Once again it was ideal temperature and remained dry for a week after application. I kept off the drive for a week to allow the product ample time to cure but once again the product appears fine until it rains. Once rain has fallen the weight of a car along the drive lifts a small amount of the product leaving clear tracks where the car has been. The overall finish remains very good but it is a shame that it does not have more durability so that wear tracks do not form. The product certainly has stopped the deterioration of the Tarmac with no more dusty gravel every time it is swept. I guess to keep the drive looking good this product would need two coats every year. Good product overall, but I have ordered this before and that was more glossshine finish not sure this time round it is more matt finish. If you after a Matt finish on the tarmac then its perfect. Dear Sirs, I would just like to thank you for the quality of your product “Tarmac Restorer”. I purchased this from you in November last year but have only just got around to using it on my drive due to all the rain we have had this year. I carried out the whole job yesterday and am very pleased with the result. Two of my neighbours have already asked for your website address so they can order as well. Please find some photos of the end result. I regret I did not take phots of the “before” but I am very pleased with the “after”! Ordering and service was excellent. The biggest problem is getting rid of the moss which is virtually impossible in a pitted surface. Once applied the Tarmaseal makes the drive look great like new Tarmac. Due to weather I have only had chance to apply one coat yet but will do the second as soon as I can. However running cars over the surface constantly seems to take off the black coating on the peaks of the aggregate in the tarmac (so a lighter colour) quite happy with the product but time will tell. Have used this many times before and last application has lasted three years. Disappointed that it is no longer supplied in a bucket style container as this would make it difficult to mix easily... fortunately i kept one of the old containers ... so no problem for me ! I purchased this product to restore my 20 year old tarmacadam runway. The surface was still solid with no cracks or holes, but loose material was coming off the surface and looked like it was drying out. My plan was to apply 2 coats of tarmac restorer. Here are my comments on doing the job. I initially brushed all the loose material from the surface and applied a moss/algae killer product to ensure the surface was moss free. A week later I brushed out any dead moss then power washed the entire area. Calculating the area of my runway was a bit tricky due to the awkward shape, however my best guess was 97 square meters. So two coats would result in 194 square meters. The supplier estimates a coverage of 40 to 60 square meters per 20 litre container. I decided to opt for around 50 square meters per 20 litre container which should require 4 x 20 litre drums of tarmaseal. My order arrived within a few days of ordering which included a "bucket tray" and a sturdy roller. The roller sleeve was smooth and I thought might not be up to the job on a rough surface. On applying the first coat I was surprised how difficult it was to apply and took me 6 hours to complete. The difference after the first coat was amazing, but hard work. Before starting the second coat I purchased another roller kit locally which was designed for roughcast and other rough surfaces. This made all the difference and only took an hour and a half to complete. So I would not recommend purchasing the roller kit. I found that I had enough tarmaseal for a third coat. I can honestly say that my runway is now looking great. Time will tell if the "restoration" has worked. Did the job perfectly, my drive looks like the tarmac has just been laid. Well pleased. I look into this product, and went with reviews left by other buyers. The whole service was first class, from ordering to delivery. I used 6x 20ltr to cover my drive. The results were first class, takes driveway up to standard of newly tarred. Well worth the cost, pay for what you get. The roller system that's available is worth the buy. Excellent product. I applied this two years ago. Initially it made a dramatic difference and looked great. I used the roller kit but found it failed partway through and I resorted to a brush which worked fine. After two years the driveway still looks good, it has faded a bit, especially at the points of high wear but is still looking far better than it did before I started. It has required cleaning each year but that is to be expected with the use it gets. 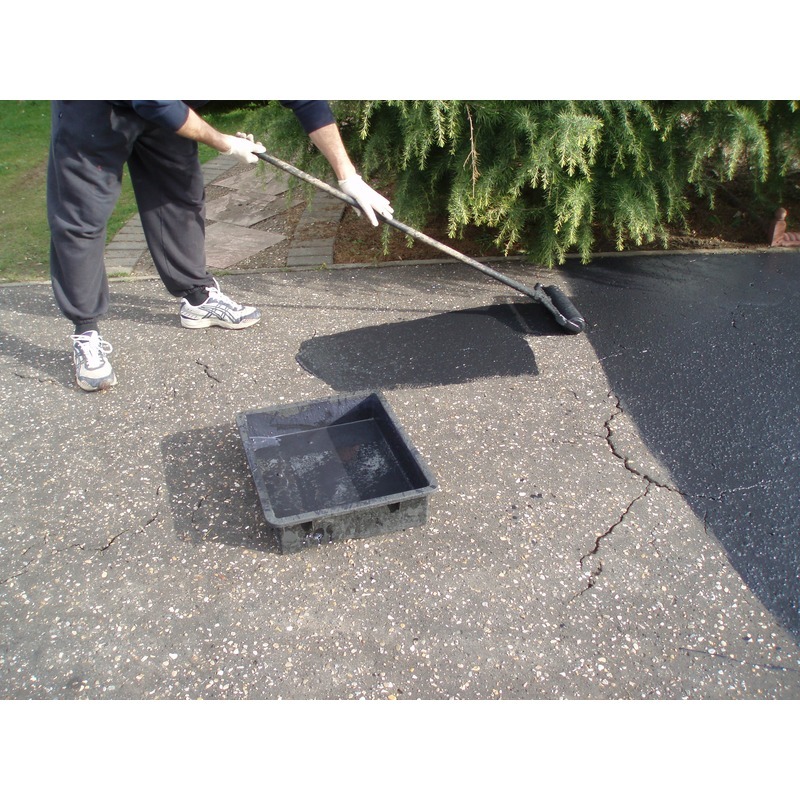 Overall, great product that does improve the look of your driveway and lasts. Took a long time before I made my decision to buy Smartseal, I wasn't disappointed its vey good. Everywhere looks imaculate. I used 10 x 20 litres to cover a large area well worth the cost. Very pleased with this - did a great job. Would recommend it. Had a lot of compliments from neighbours who think I have had a new drive laid. Plus it was easy for me to do myself so no pricey tradesmen! Very pleased with the finish that has been achieve with this product on both the block paving and my Tarmac. Preparation is key, I found the video was a great help. The product is very good and extremely easy to apply, brushing for the edges and roller kit for the main body of the drive. Gives a much improved appearance and has been complemented by a neighbour. The staff are extremely helpful. Product and staff are excellent (5 stars). 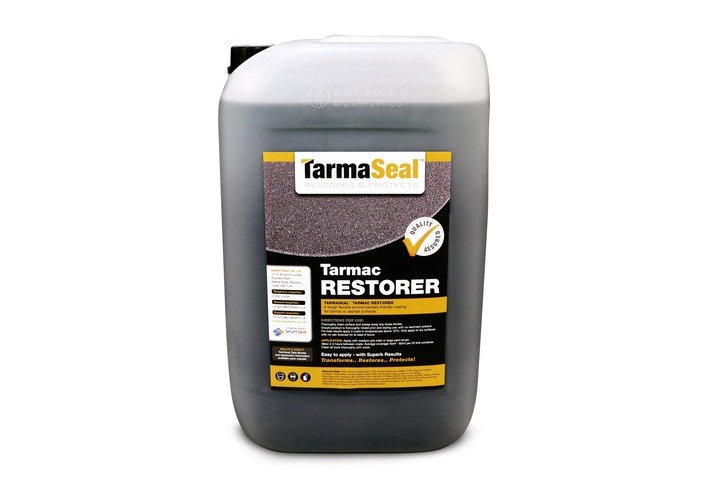 I first purchased the trial bottle of black Tarmaseal and was impressed after application in different areas, I then purchased sufficient to allow for two coats of my driveway plus front and back walkways, the service was first class with delivery made one day after ordering. All neighbours and passersby have commented on the impressive result ,many thought the driveway had been relaid with tarmac, very impressed and would highly recommend ,very easy to apply. 5 star rating. Excellent product the drive i used it on was 130 sq meters and came out excellent after 2 coats. I'd endorse the comments of other reviewers, my drive was in a poor state with the surface loose and cracked which required considerable preparation to remove the loose particles. Two coats were necessary on the majority of the drive but a newer area required only one. However, several days after application, on areas where rainwater puddled' subsequent brushing (to remove the puddles) resulted in the sealant coming off. This may be due to the sealant not having 'cured' fully, the weather wasn't particularly good. A further coating on these areas restored the finish, and so far, things are still looking good! Very impressed with the rapid delivery of the this product, and ultimate end result. I have just finished my driveway, and it really looks the business. I suppose time will tell on durability, but as with any d.i.y. job, it's all down to the preparation. I had to paint about 58sq mt of tarmac. Firstly, I got rid of some moss in the shaded areas, treated it, let it die, then got a big wire sweeping brush and worked that it to get out the moss. I then went over the whole drive with the same brush, to 'scuff up' the surface. I then swept the debris up with a standard yard brush. Then I got the garden hose with a jet nozzel on it, and sprayed it and worked a brush in at the same time to clean the surface as best I could. The next day, when it had dried, I swept it again (I could now eat my dinner off it!!). All of that was hard work, believe me. My shoulders are killing! I then went round the edges applying masking tape to areas beyond the edge that I didn't want the paint to touch. Then I applied a good coat of paint round the edges with a 4” paint brush, as the roller won't get up to those parts. Then I applied a coat of the paint over the whole drive with the roller that Smartseal sell. It's a really strong roller device, with a thick absorbent foam roller. To get into the crevices of the tarmac (mine isn't the smoothest of drives ever laid! ), I had to apply quite a bit of downward pressure at times to squeeze the paint out of the roller, but it worked. However, I did use nearly a full 20 litre pot, so the estimate on the website of 40-60sq mts seems about right, as you would probably use less on a smoother drive or a tennis court. It took me over 3 hours to do the first coat. Thanks to some fine weather, I got the second coat done the next day, after giving it another light sweep first. From my experience, here's a tip. Ideally, avoid painting on a warm sunny day especially if you are doing a large area. In this type of weather, the paint dries quickly, so if you overlap an area that has dried a bit, it will show up slightly, as it did with mine. If your drive is in the shade, then it shouldn't be so noticeable, otherwise wait until the sun is not shining on the surface, or a cooler time in the day, and you should be okay. The paint shouldn't dry as quick, so you'll be able to merge each strip/area into the previous one without it showing up too much. I did this on the second coat, and it now looks really smooth. I suppose the weather, dust, leaves etc will tone down the newness of the paint over the coming months, so any blemishes will fade away (we hope!). This is an excellent product, and the customer service guys are very helpful. I hope this has helped any future purchases of this product. Excellent product. Applying two coats brings the driveway looking brand new. This is a quality product. I did brush most of it on, as the roller did not get the seal into the drive base. I also used more than was recommended , but the final effect was good. I still highly recommend it, despite the price. brilliant stuff old defientley buy again made my driveway like it had just been done. I was preparing my house to put on the market and my tired drive has been transformed with the Tarmac Restorer, had read some negative reviews and can happily dismiss them, I am not easily pleased but I am very much so, can highly recommend. Superb product! I decided to buy 20L of black Tarmaseal to treat my tired drive after reading good reviews on this site and others. The goods arrived in a couple of days after good communication from Smartseal. After filling holes and gaps with cold lay tarmac, I coated the surface using the 12in roller (also purchased from Smartseal) and a brush for the edges. Tarmaseal goes on easily, covers well and dries quickly. I allowed the suggested 2 hours between coats but it was dry sooner. I took my time to ensure an even coverage but my four car drive was done in a day. Cleaning up is easy too as it's water-based. The final look is excellent. It has been the subject of lots of complimentary remarks during and after the work and two neighbours have ordered Tarmaseal for their drives. Great job Smartseal! Very pleased so far. Has transformed the appearance of our drive. Providing it stands the test of time, I would give this 5 stars. Arrived quickly after ordering, only complaint would be with a rather miserable delivery man who considered it an imposition when my wife asked him to leave it round the side of our house. Purchased 20lt drum on Friday 5th September 14 arrived Monday 8th November 14 Prepared Drive which was showing signs of wear. Applied 2 coats of Smartseal and can say from 1st impressions very pleased with result. I used ALL 20 Ltrs. Drive looks brand new. Will purchase further 5 Ltrs to apply further coat when needed Highly recommend this product. Excellent product, highly recommended. Used this for my driveway. 5 stars ! My drive is 84 sq. mts. & was in not to good condition. I repaired the edges that had sunk and several pounding areas before applying Smat Seal. What a difference, it looks better than I expected. People passing stopped and commented on the finish as I was applying the coat saying it looked good. That says it all. Thank you for a good service and a good product. Blown away by the results! Have received a number of compliments/inquiries about the product and have made the appropriate recommendations. An outstanding product and excellent service. This coating gives superb results, and has made my 18 year old drive look like new again. It may seem expensive but the quality and service are excellent and well worth the cost, your order usually arrives by next day courier delivery. I would not hesitate to recommend this product and company to anyone. Very good product, looks fantastic, easy to apply and has impressed the neighbours! My son is doing his drive next year, after seeing mine. Customer services very helpful and friendly. An excellent product. Transformed my 40 year old tarmac driveway. It really does look like re-laid tarmac. I would not hesitate to recommend it. One coat of Tarmaseal has been applied to my drive and it looks great. However, where it has been applied by hand with a brush around the edges it has dried with a sheen leaving the roller applied coating drying flat. Two coats Re obviously necessary so now I am waiting for a fine day to apply second coat which I'm sure will look great. Just bought 20 ltrs of this Tarmaseal Tarmac Repair product as must say what an excellent product it is especially as I have previously used the Thomson Tarmac Repair paint. I also purchased the roller kit, although I think that is over priced. It went on like a dream, very easy and fast and looks fantastic. The only down side is that I only needed to use half of the 20 ltrs to do two coats on my driveway which is 6x9 mtrs so I guess I will have some to do next year. A brilliant product, and this came with excellent service as well. My drive looks 100% better. I would recommend this product to anyone. 2nd puchase. Drive was borderline replacement condition but the restorer did a fantastic job in binding and renewing it last year. Decided to top up again this year to build strength further. looks as new when covered but top of chippings wear off quickly leaving a speckled look which was not a surprise due to poor start condition. very pleased - just wish I'd done it many years ago. 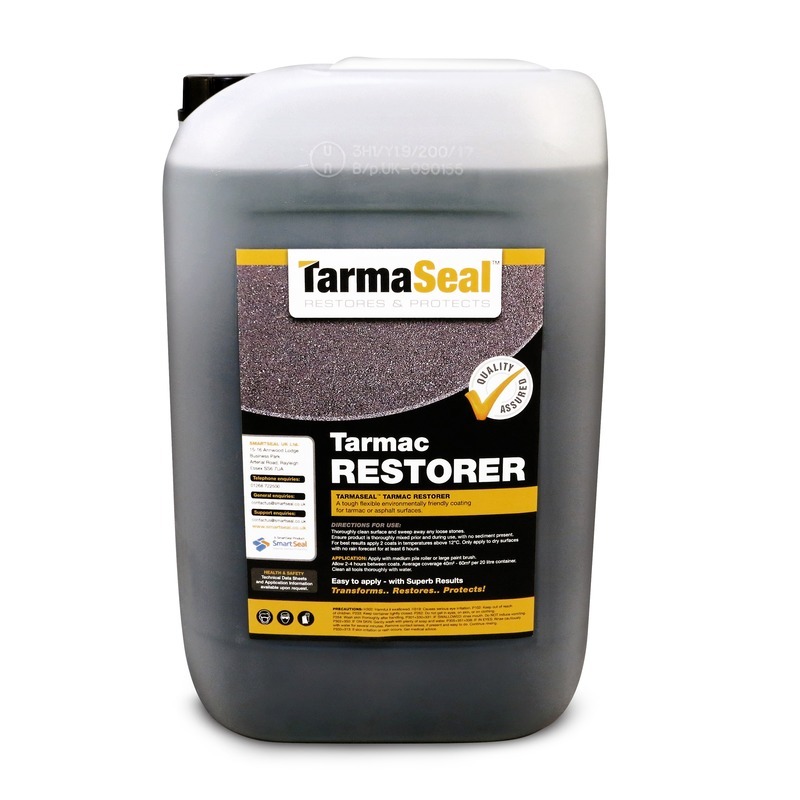 Tarmaseal is the best product on the market in my opinion. I did a lot of research before using this product. It is incredibly easy to apply to Tarmac with brush/roller. I had been let down by an installation company previously so decided to do the job myself and would like to thank Smartseal and Nigel personally for his expert advice and brilliant customer service. Many Thanks. On the 1st coat on a very rough surface, 45 sq m needed 30L. On the 2nd coat, 45 sq m needed 20L. Very easy to apply with the supplied roller and dries quickly. This is a first-class product and made a superb job of restoring the surface of my driveway. 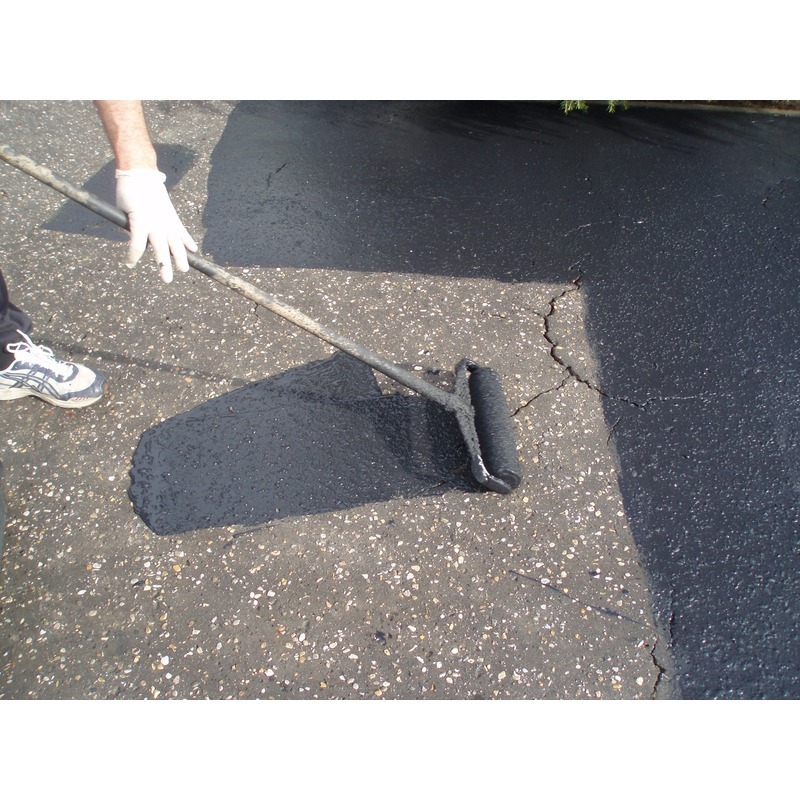 Straightforward easy ordering and payment process via Internet with delivery of the 2 x 20litres of Tarmaseal Tarmac restorer in three days. Excellent, easy to apply water based product that covered my 70 sqm drive comfortably with absolutely amazing results. My drive is now transformed to like new and has drawn some extremely complimentary comments from my neighbours. As with most jobs, the secret is not just in the product but in the preparation. I spent a long time ensuring the Tarmac was clear of all moss and vegetation with meticulous brushing to remove the small loose stones. The Tarmac looked excellent, other than the colour, before the restorer was applied but absolutely superb after two coats. I applied the restorer on a very warm Saturday, the day before Andy Murray won Wimbledon. It dried within 30 minutes and as soon as one coat was completed the second was applied with whole job comfortably completed within 6 hours. I left the drive to harden before for about 6 hours before driving my car over it and into the garage without the surface showing any marks. I am absolutely delighted with the result and the overall transaction and would have no hesitation in recommending this superb product. We were very impressed with the product and the service, and extremely impressed that the enclosed letter had actually been signed by a real person, using a real pen. We feel this showed a true professionalism from your Company. First class, the only bad part was the preparation, but then it always is. Excellent product, drive looks great. I would recommend erring on the generous side for coverage as the finish will be better if applied in one go. I didn't and there is a slight difference between coats two days apart. Wow amazing product and well worth the money. Just like its been retarred. Wow, very impressed. Large driveway approximately 11 years old. Power washed. Took about 2 hours to apply the sealant. It looks like new! Don't be put off with the price. This is a quality product! I recommend buying the roller kit too! So easily applied. Excellent customer service in connection with initial enquiries. Speedy and faultless delivery arrangements. Applied to a relatively small, 20sqm, drive entrance. Dramatic improvement after two coats but now wait to see if this is sustained, hence 4 not 5 stars. Many thanks. Recently completed a car park project using Tarmac Restorer, we were able to complete the job to our clients complete satisfaction and found that the product was of excellent quality and went a long way. I have used this company and products several times now and have always been happy with the service and performance. My customers have been very impressed with the finish of Tarmac Restorer in black and I would not hesitate in reccomending this to anyone. Excellent service. Recommended quantity for 120sq metre drive covered it 3 times and still approx 5 litres spare. After the bad weather eventually applied this product. The results have been amazing, from a tired drive to a drive that looks better than the original tarmac. Comments and questions from the neighbours on where can I get this Quality Product have been passed on. Service and Product are second to none. Well done! Hi, Great product and very good service! Absolutely delighted with this product. A section of my tarmac driveway was covered in paint, concrete and other unsightly marks, however one coat of Smartseal has made an enormous difference and I think a 2nd coat would make it look as new. Delighted and would certainly recommend. I've used this product on a number of occasions, and without exception the results have been excellent. More importantly, my customers have been delighted with the transformation in their tarmac drives. Would have no hesitation in recommending both the Sealer/Restorer, and the advice and professionalism of Smartseal themselves. The entire ordering process was excellent. We even received a call after our order advising we may need a tint as we chose the red colour and they had reports it was too bright. They included this FOC. Also, they advised on a different crack repair, and even though it was a greater cost, since they had processed the order they did not charge the difference. Now the product. We just recently were able to use it due to the weather and we've had people stop and ask about it and admire it as they walk by. WE LOVE IT. The directions were easy to follow and our only setback was rain that appeared when part wasn't dry but we had enough for another coat. We would recommend this highly. The product was exelent to work with and easy to apply with the roller that was supplied,if I were to say anything negative it would be after the first coat the drive was pretty patchy but after the second coat all was well. Good product, easily worked, great consistancy between tubs, great result. This product was purchased after much research on the net, and it was delivered prompltly. On stiring/mixing the product correctly I applied virtually two coats of the black tarmac seal to my drive, but needed to use very little from the 2nd 20 litre tub, this dried a different shade, the drive being matt and 1/10 a finish gloss like. A complaint the next day required a photo E mailing to prove the problem, and after several calls, a manager I presume sent out two new 20 l tubs and a new roller/tray free the next day. I needed to do a third coat, as the 1st tub being very matt black was clearly wrong, but the finish is now superb. I hope that was a glitch in what overall is a very good product. Product 5 star, Overall 4 star as some of the questions on the phone made me feel as if I was trying to blag more sealant, when clearly not. Mr K Goodman. A fantastic high-end product. We will continue to use this product on the tarmac driveways of our customers for years to come. The driveways we renovate for our customers are the envy of their neighbours thanks to this great product. It is easy to apply and does provide that 'just laid' finish. It is worth the cost without doubt! The sealant was delivered within a few days of ordering ,my drive has been down 6 years was in good condition but badly stained and showing signs of wear,a total of about 7 hours and two coats of sealant my drive now looks as good as the day it was layed , actualy it looks better even my neighbours have commented how good it looks, I am so pleased and would recommend to any one , actually I already have at least half a dozen times already . This sealant gets a five star rating from me . Very impressed with product, didn't expect such good results. Easy to apply and delivery of product was very quick. 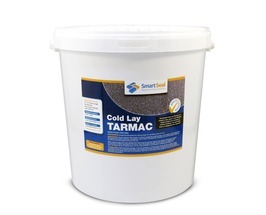 If your old tarmac driveway is in reasonable condition and you would like to give it that "freshly laid tarmac look" without the newly laid tarmac price tag, then this product is for you. wasn't sure whether or not it was going to look right as I was applying it , but end result was BRILLIANT!! Firstly, service received. This was excellent. I placed two orders the first was for 2 x 20litres of SmartSeal, fungicide, and repair compound. The delivery was made within 2 days. I had one issue, the fungicide container was leaking. I phoned SmartSeal and they refunded the money for the fungicide without quibble. My second order was for 2 x 20litres SmartSeal. This was delivered next day. Drive is approximately 80sq.m and was looking as if it had seen better days. The colour had faded and there were alot of small stones trailing into the house. I put the first coat on the drive with the roller bought from SmartSeal. Certain areas were rougher than others and here I found it best to use a brush. The second coat was much easier to put on as the SmarSeal had obviously sealed the drive, and therefore the second coat took a little less than the first coat. The drive now looks like new! Colour is fully restored and the sealant has done its job. There are no more stones traing into the house. An excellent product that has totally restored the drive. The biggest challenge has been the UK weather! getting a dry day to apply the product. 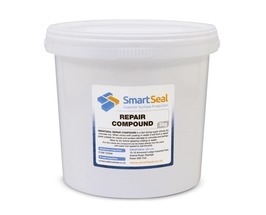 After looking on the internet and checking various alternatives I ordered 3 x 20L of Smartseal tarmac restorer and some crack repair compound. . The area I wanted to restore was 120msq. After a jet wash of the existing surface and filling of some minor cracks with the quick dry filler i was ready to begin. The material was very easy to apply and covered very quickly, I found that the material dried in under 1 hour. The 120 m sq job took about 6 hours to complete single handed and the result was amazing, the drive was completely transformed and I am delighted with the result. Several of my neighbours have commented on the difference the coating has made and I would have no hesitation in fully recommending and endorsing Smartseal to anyone thinking of using it. This Product is Brilliant !!!. It completely transformed the look of my Driveway at a fraction of the price of having a new Tarmac Driveway laid. Will recomend this to all my neighbours. Smartseal Tarmac sealer is a superb easy to apply Tarmac restorer designed to rejuvenate and transform tired tarmac. 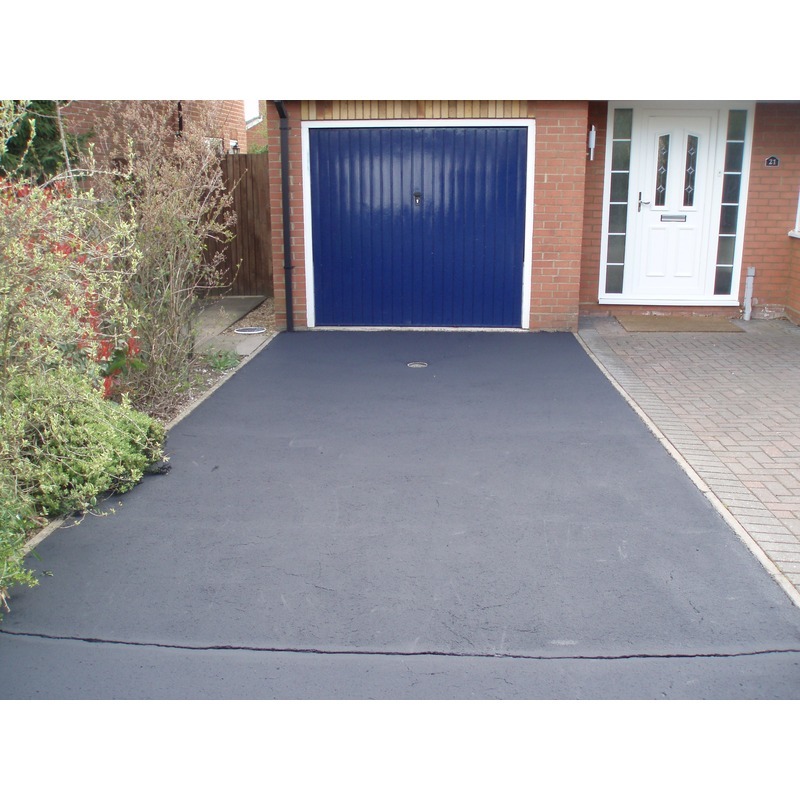 Tarmaseal is far superior to a tarmac paint and offers a cost effective alternative to a full replacement of a driveway. For more detailed information visit our dedicated Tarmac Paint website. Ensure the surface is thoroughly cleaned with a pressure washer or jet washer. Allow a minimum of 3-4 clear, dry days before sealing. Before coating, sweep area and remove any loose stones. Make sure product is thoroughly mixed with no sediment present. For best results apply 2 coats in temperatures above 12C. Only apply if no rain is forecast for at least 6 hours. 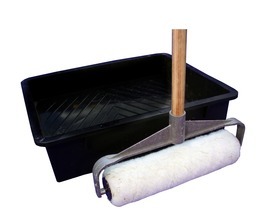 Tarmaseal can be applied via a medium pile roller or large paint brush. Make sure a minimum of 2-4 hours is left between coats. All work should be carried out with safety goggles, mask and gloves.